The ALOGIC VGAHDUP portable VGA to HDMI adapter converts the VGA port on your computer into an HDMI output. 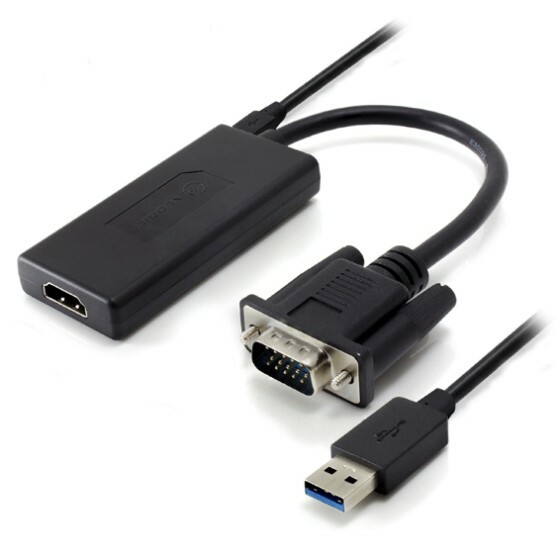 The adapter lets you use your existing VGA enabled computer with an increasing number of displays and projectors that only support HDMI.The adapter allows for hasslefree plug and play setup with no need for drivers. The adapter is capable to pass thru audio via USB cable its enabled with a micro USB port on the adapter. The adapter may also need external power through the Micro USB port when used with certain computers for proper functioning.The VGA to HDMI adapter will work with any operating system but when working with a Windows computer the adapter supports native USB audio allowing you to add your computer audio to the HDMI output signal.